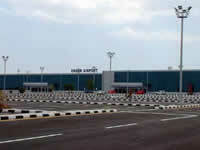 Ercan Airport in North Cyprus officially opened for business in May 2004 and was conceived to be the doorway that would connect Turkish Cypriots to the rest of the world. This modern designed airport is equipped with all the facilities you would expect to find and the building itself is light and airy too. There are over 100 flights into Ercan airport every week especially during the summer season. The airport itself is located in North Nicosia and from the moment you arrive you will feel the relaxed atmosphere of North Cyprus hit you. When you step off the plane don’t expect to be greeted by packed transfer buses, instead all you have to do is stroll across the tarmac to the terminal building where you can collect your baggage without any hassle. From the terminal building it is just another short stroll into the sunshine where your hire car will be waiting for you. Ercan Airport has all the facilities you would expect in an airport and when it comes time to leave North Cyprus after a wonderful holiday you will find several duty free shops waiting for you. Prices here are often displayed in Euros but you can pay in a number of currencies including Turkish Lira, US Dollars, and Sterling. For those of you looking for bargains then alcohol and tobacco should be top of your list. Make sure you remember to check your allowance though. The airport also has two cafes where you can relax and enjoy a drink or a coffee while you wait on your flight. All flight announcements are made in Turkish and English. Pegasus Airlines which has regular flights from Istanbul airport which is an excellent connection point for those travelling with easyjet from London to Istanbul. Atlas Jet offer scheduled flights to all airports within Turkey but now also offer charter flights to Ercan Airport from the UK and other European destinations including Holland, Denmark, Germany, Italy, Spain, and France. Turkish Airlines fly from Istanbul in Turkey to Ercan Airport. Currently there are no direct flights to Ercan Airport and all passengers travelling here must stopover briefly in Turkey first. It is hoped that direct flights will be a thing of the near future though.